“Portrait of Dyakova” is one of many portraits of Levitsky. Neglecting means of expressiveness, such as a background, fancy clothing, or symbolic objects that give the picture a second, or even third, layer of meaning, he found the differences of models in a barely noticeable turn of the head, in a leaning shoulder, in a smile or a serious look. Putting the man at the forefront of his work, he walked away from the man, doing everything to show his personality, his soul, using the mean set of expressive means by which he limited himself. Dyakova was from a large family, fond of art. Her lively mind, education, beauty and cheerfulness attracted people to her. Poets dedicated poems to her, artists painted her portraits. The story of her marriage is touching. Her husband was poor and her parents did not want such a son-in-law. Having learned about this, the young people married in secret and for a long time did not speak about this to their relatives. The deception came to light only a few years later, and the parents, actually confronted with the fact, were forced to give their blessings. The picture Dyakova depicted the way it was in life. Her hair, folded into the tail, slightly curled. Light eyes look a little to the side, lips are touched by a slight smile. She is dressed simply, in a light dress, and her whole image expresses lightness, the ability to perceive life as an intricate game, gaiety and liveliness. She seems to be ready to leave the place right now, to run away into the garden, to start dancing or singing. Her house (she and her husband had five children) was always the center of the cultural life of St. Petersburg. 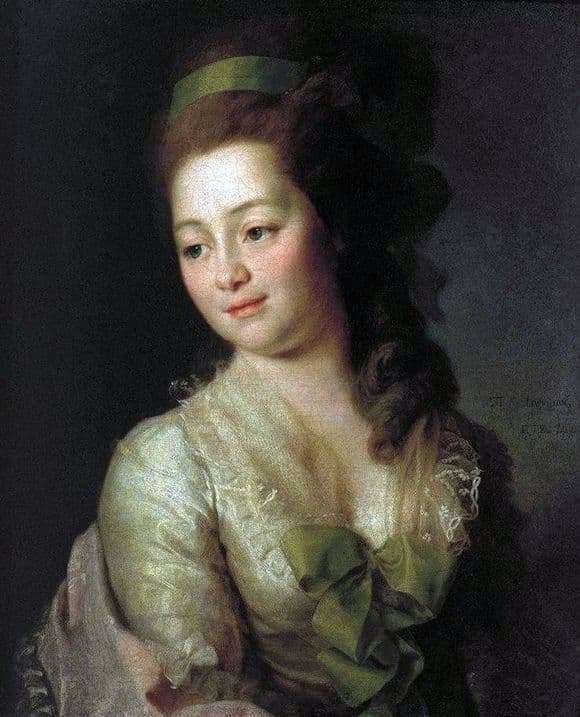 Judging by how pleasant Dyakova looks in the portrait, each guest in her living room was nice and cozy. No one remained forgotten. No one felt lost. Being able to engage in conversation, entertain, and laugh, Dyakova attracted people – including inhospitable ones – like a magnet or a shining warm sun.